← Bougainville News:Bougainville will move its clocks forward by one hour on 28th December, 2014. Bougainville Law and Order News: Police could pull out of Buin town due to no support from the local communities. This was the message from the Commander of Bougainville Police based in BUIN, Senior Sergeant JOHN POPUI. He told New Dawn FM in Buin that Police have been living in Buin under extreme pressure due to no support from the local communities. Senior Sergeant JOHN POPUI made these remarks after one of his Police Officers was attacked by a group of men from a nearby village. The Police Officer got his left hand, leg and head sliced by a knife wielding man. The Police Officer, named was off duty and was attacked outside the Police Station and was rushed to the Buin Health Centre after the incident. Senior Sergeant JOHN POPUI said that he personally followed the attackers to stop them but they also threatened him. He told New Dawn FM that the incident had nothing to do with yesterday’s launching of the Radio Ples Lain in Buin but those involved had gathered to witness the launching in Buin Town. Commander Popui also said that the incident also disturbed the broadcast of Radio Ples Lain in Buin and had to leave Buin in the early hours of this morning for Buka. He said they were supposed to Broadcast for the second day today Sunday. The Police Commander said that the use of knives in town only happens in Buin town and not the other centres like Arawa and Buka. He said this was not the first time his Police Officers were attacked by villagers and does not want to tolerate these actions anymore as his officers are also human beings who have families. Senior Sergeant POPUI said the communities in Buin must rise and condemn such actions that is threatening the rule of law and peace in the Buin District. He said if Police abandon Buin town, the conduct of the coming ABG general election in South Bougainville could also be affected. 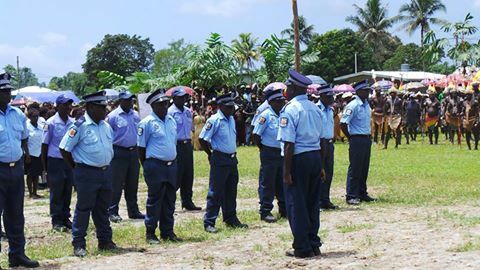 Meanwhile, New Dawn FM understands that the Police manpower decreased when the New Zealand sponsored Community Auxiliary Police project was transferred to the Autonomous Bougainville Government and funding discontinued.